The monument which is of Bowral trachyte on a brick base and bears a bronze plate, commemorates the first official party of British explorers who passed through the district in 1798. It was unveiled on the 150th anniversary. 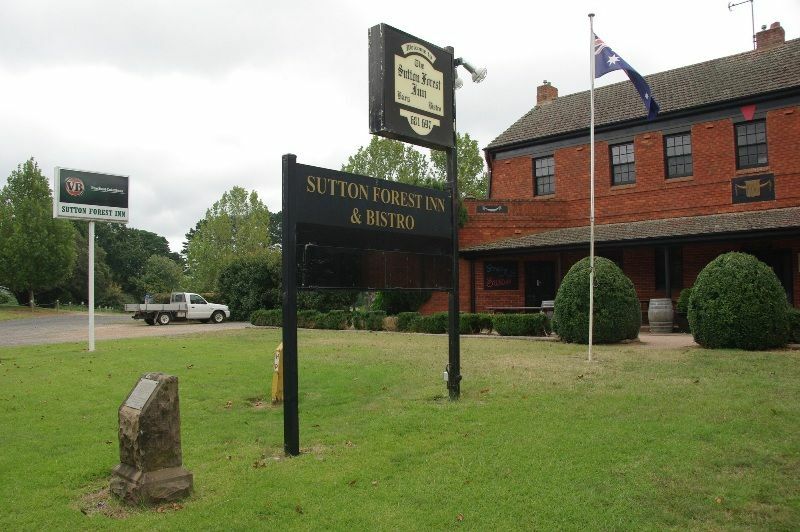 The unveiling of a memorial tablet to commemorate the visit of the first explorers to Sutton Forest was prefaced by a service, attended by about 60 people, in the time-mellowed church of All Saints, Sutton Forest, conducted under the auspices of the Ministers fraternal of the Berrima district. Briefly, the order of service was: Hymn, "O God our Help in ages past"; appropriate prayers led by the Rector, Rev. P. Wilde; scripture reading, the 111th Psalm, by Rev. C Wheeler, Methodlst minister at Moss Vale; hymn, "Praise to our God"; and an address by Rev. J. F. Mason, Anglican clergyman at Moss Vale and president of the Ministers' Fraternal. The service concluded with the hymn "Now thank we all our God," and those present then joined a further gathering at the site of the monument by the roadside in front of the Royal Hotel, Sutton Forest, for the unveiling of the tablet by Mr. Bryce Beard, M.B.E., of Bowral. Southern Mail (Bowral, NSW), 2 April 1948. 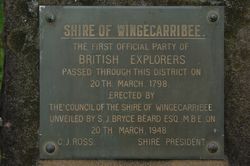 The first official party of British explorers passed through this District on 20 March, 1798. 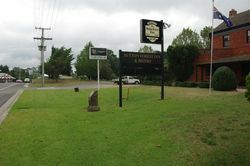 Erected by the Council of ohe Shire of Wingecarribee. Unveiled by S J Bryce Beard Esq, MBE, on 20 March, 1948. C J Ross. Shire President.